This week, I present four photographs from one of the timelapse cameras along a restored wetland in our Platte River Prairies. All four photographs were taken automatically by the camera, and none are particularly striking images, artistically speaking. Despite their quality as images, or lack thereof, they are very meaningful photographs to me. In fact, the two photos of least photographic quality are actually the two I like best because they tell a story I’ve been hoping for since we first started the wetland restoration project more than 10 years ago. Canada geese, some wigeon, and a few other ducks sit on the restored wetland in March of this year. This is a common sight, and a good one, but I was always hoping for more than just ducks and geese to use the wetland. – removing the trees around the edge of the site to improve habitat for open-grassland and wetland wildlife species. – providing shallow stream and wetland habitat for fish, amphibians, reptiles, invertebrates (including mussels), and other species. – restoring diverse plant communities including emergent wetland, wet meadow, wet-mesic, and upland sand prairie communities. – providing habitat for migratory whooping and sandhill cranes and many other waterbird species with similar habitat requirements. The first three objectives were pretty easy, and we’ve seen abundant evidence of success. 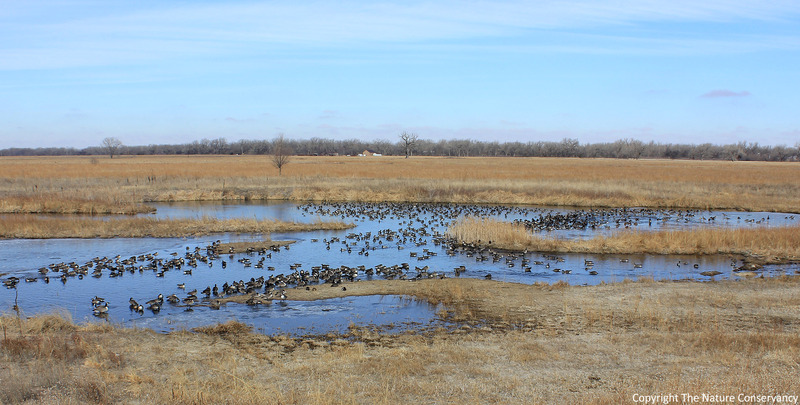 In terms of bird habitat, we’ve always had great utilization of the site by ducks, geese, herons, snipe and other birds during both migration and breeding season. But no cranes. The chance that one of (approximately) 260 whooping cranes will ever land in this particular wetland is very remote, but I have been expecting to see sandhill cranes using the site; if not for overnight roosting habitat, at least as a place to feed and loaf during the day. After all, there are hundreds of thousands of sandhill cranes here each spring – surely some of them should see this as an attractive place to hang out now and then. And if we see sandhill cranes using the site, we can reasonably assume that it’s suitable for whooping cranes too (though that’s not universally true). However, during the 10 years since we started the restoration work, I’ve been looking in vain for a crane of any sort, or even tracks that would indicate they’d been there. Nothing. Last year, we had timelapse cameras up during the spring crane migration season but they malfunctioned and didn’t give me any evidence one way or the other. But this year, I finally got what I wanted. Three sandhill cranes stand in the middle of the wetland on March 8 of this year. You can click on the photo to see a larger version of it. I downloaded images from the cameras in mid-March and immediately scanned through them in the truck, hoping to see some evidence of crane use and – there they were! Three sandhill cranes showed up in multiple photos over the period of a couple weeks. Most of the photos were daytime photos, but it also appears they roosted overnight at least a few times, standing in the shallow water. Three cranes is certainly not evidence that we’ve added significantly to bird conservation, but it is evidence that our wetland isn’t completely abhorrent to cranes – and that’s a good start. Then, as I kept looking through the images, I got an even better surprise. Late in the evening on March 11, there was a whole flock of cranes standing in the shallow wetland, apparently preparing to roost. Even better, the camera picked them up again early the next morning – pretty solid evidence that they roosted overnight. It only happened once (through mid-March) but I’ll take it! 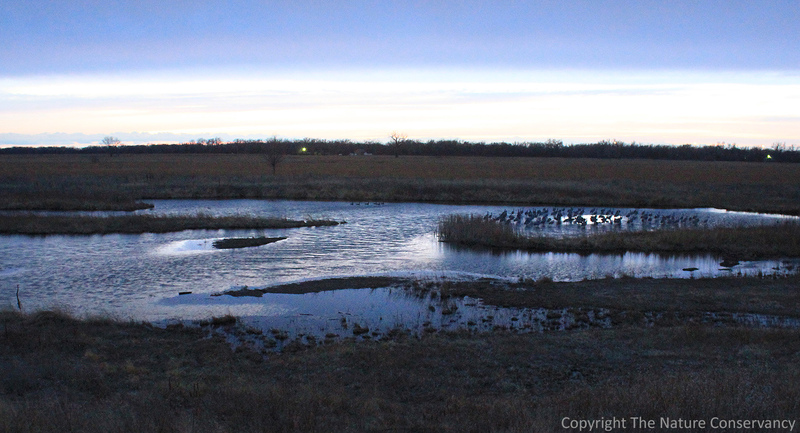 A flock of 70-80 sandhill cranes stands in shallow water at 7pm on March 11. At 7am the next morning, the cranes are still there – maybe more of them, in fact. Our first real crane roost… that we know of. The pictures aren’t of terrific quality. They were taken by a camera set to fire every hour on the hour (during daylight hours) and low light and wind combined to the images a little blurry. Nevertheless, I think they’re pretty great photos. Of course, now that I’ve gotten my evidence of crane use, my scientist brain is kicking in and asking questions. Why did the cranes only roost one night? Why that particular night? Why did they pick that particular part of the wetland? And, there’s one more question my brain is asking, which I’m trying to ignore because I don’t think it’ll ever happen. …Will we ever see a big white crane in one of those photos? This entry was posted in Prairie Animals, Prairie Natural History, Prairie Photography and tagged cranes, habitat, restoration, sandhill cranes, timelapse, timelapse photography, wetland, wetland restoration by Chris Helzer. Bookmark the permalink. Chris it had to happen sooner than later. Folks in Nebraska in particular think cranes only roost in the river, not so. Last month I was in Idaho on the Payette, Boise and Snake Rivers and found them roosting adjacent to the river on wetlands or what we would call wet meadows.Maybe they like “diversity”! Thanks Leroy. I agree with you – it’s a very satisfying thing to create new habitat and watch it be used. Chris we have been seeing a good number of cranes roosting off river this season from woodriver br. to minden br. and I think there is a good chance some day to see a wc there, and the new numbers are out last week 304 wc in the wild know. Thanks Bob – the added attention will be much appreciated! Congratulations, I am so very happy for you & everyone who’s worked to make the restoration a success….& most of all, for the cranes. I’ll keep hoping that whooping cranes find your restoration site too…they need all the help & good habitat they can get. About ten years ago, a large flock of sandhill cranes spent the night in out calving pasture about 2 miles from the Niobrara. There was a light fog and they would fly up and then land again as my wife rode through them checking the cows. About 10 in the morning the fog lifted with a light south wind and within an hour thousands of sandhill cranes were gone. When the weather is foreboding or weariness has overtaken the traveler there is nothing better than a safe comfortable place nearby to rest for the night. Even better would be two (or more) big white cranes. Great work Chris and fellow TNC staff. Don’t give up on the whooping cranes. The Wisconsin Prairie Enthusiast did a large wetland complex restoration and immediately following a pair of whooping cranes hung out all summer.